This Workshop series has been cancelled due to lack of enrollment. Sorry! 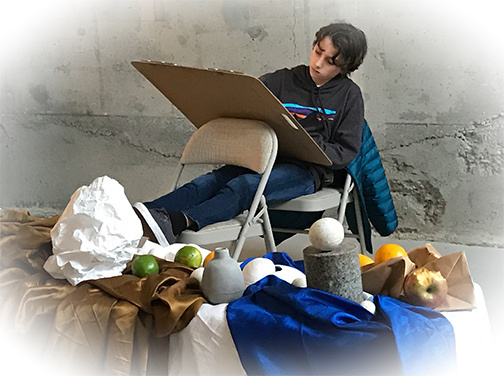 For youth 13–17, These workshops and classes are rooted in the classical atelier style of teaching, with a focus on beauty and art as a way of living. We will be establishing our “ground” by preparing surfaces for drawing and painting. I start with physical “exercises” to help the children integrate body and mind. The process of creating helps strengthen the child’s inner teacher and natural inclination towards balance and beauty, and to reach into the far corners of their powerful minds. This creative work, helps to develop focus and build muscles to remain calm in stressful or challenging situations. We will be working from life. Out in the “field”, creating and working from still lifes, and eventually taking turns drawing each other. Materials fee to be paid to the facilitator the first day of class. Please bring to class a 18” x 24” drawing board, it is a great tool to have at home also. They can be purchased at any art supply store or you can make one out of a lightweight, smooth board. (CANCELLED) Jan 9 to Feb 13 3:45– 5:00 p.m.
$150, $120 OHCA members, $30 materials fee. Melissa is an experienced artist who works in oil, watercolor, silver point, bronze, wax and clay, and with nature-sourced grounds, binders and pigments. She served as artist-in-residence in Sweden, and her work has been exhibited in galleries both nationally and internationally. Recent shows include representation at the Sonoma Museum of Art. She has served as both an instructor and a monitor for figure classes in NYC and Europe. She is presently teaching figure and life drawing at the O’Hanlon Center for the Arts in Mill Valley and The New Village School High School in Sausalito. She also hosts a weekend drawing program at The New Village School. A selection of her paintings can be viewed at revelation gallery, 401f Miller Avenue, Mill Valley, CA 94941 and at her old website here: www.melissaparhm.com A new site is currently under construction.